Which Is The Best Walking Cane For Stability [April 2019]? If you can still walk around on your own but feel like you could use some extra support and balance for stability, it’s time to get a walking stick. A walking stick, or cane, is usually the first walking aid you get as you age. It allows you to keep walking on your feet for longer before you get to the point where you need a wheelchair or mobility scooter. Choosing the right walking stick is essential not just for your mobility but for your safety as well. Below are the most important factors and features to consider when choosing a walking stick. We’ve also reviewed the 5 best walking canes you can buy online. We looked at factors like ease of use, materials and comfort to pick the best ones. Whether the walking stick is for yourself or you elderly parent, here’s what you should consider when comparing different types and brands. Height is one of the most important factors to consider when choosing a walking stick. It’s especially crucial if you are buying a non-adjustable one. You need to make sure it is comfortable and safe to use. If it’s too short or too long, it will not provide enough balance and support. To measure the right cane height, stand upright with your hands on your side. Ask someone to measure the distance from the ground to your wrist. That’s how high the cane should be. When you are holding the walking stick, it should be firmly planted on the ground with your elbow slightly bent. A better alternative is to get an adjustable walking stick. You can then lengthen or shorten it to the perfect height. Next, consider the material of the walking stick. Common materials include wood, metal and carbon fibre. Wooden waking sticks cannot be height-adjusted on the fly. The cane has to be cut to the right height. And once it has been cut, you cannot make it longer again. Metal and carbon fibre walking sticks are stronger, can take more weight and last longer. Metal canes are usually made from aluminium to keep them light yet strong. Carbon fibre canes are also light and strong but are more expensive. You should also consider what the ferrule, the cap at the end of the stick, is made of. Rubber ferrules are the best because they have good traction and absorb shock. Metal ferrules on the other hand, last longer. The handle should be easy and comfortable to grip over extended periods. Look for handles that are ergonomic with a moulded design that corresponds to the position of your fingers and palm. Moulded T-handle designs are the best. They offer a strong comfortable grip for added support and stability. A walking stick can be single-legged, tripod or quadruped. The last two have 3 and 4 legs respectively. More legs translate to better support and improved stability especially on uneven ground. Finally, consider whether you want a folding walking stick. It’s great if you plan to travel a lot and want to be able to stow away the cane in a car or bag at a moment’s notice. One downside of folding walking sticks is that they can’t take as much weight as non-folding ones. This is a tripod walking stick. The base has three points of contacts with the ground. This adds more traction, balance and stability on all kinds of terrains. It’s especially helpful if you are planning to do a lot of outdoor walking. It is height adjustable so you don’t have to worry whether it is the right fit. You can easily adjust it through 8 levels from 30.5” to 37.5”. When you need to store it in the car or cupboard, it folds in three places into a compact 13.5” length. Folding and unfolding it takes just a couple of seconds. It comes with a carrying case for traveling and storage. The shaft is made from anodized aluminium. This makes it very light – the entire cane weighs just 500g – yet strong at the same time. The maximum weight limit is 159kg which is high enough for most users. The handle is T-shaped with a well-designed contouring shape that corresponds perfectly to your hand. It’s provides a strong and comfortable grip. 3-point base for extra support and balance. Wrist strap and carrying case included. The Soles walking stick is almost similar to the one above by Hurrycane but it’s not as strong or as versatile. But at a maximum weight limit of 105kgs, it’s still good enough for most people. It is height-adjustable. There are five height settings ranging from 32.6” to 36.6”. The range is perfect for most people but the stick can be a bit too short for taller users. It is also foldable for easier storage. Use the included carrying case to store it safely. The cane is quite light, weighing just 349g. It’s very easy to use and doesn’t strain your hand. The handle has a T-style design which provides a stronger and more secure grip. It’s also comfortable to hold thanks to the soft material and moulded contours. You can use the included wrist strap to secure the cane around your hand. Comes with a wrist strap and carrying case. Available in 3 styles – bronze, silver and black. This one is a bit pricey but it offers more features. For one, it’s a quadruped walking cane. It has 4 legs at the base. It’s perfect for those who need more support. The extra-secure base also comes in handy on uneven outdoor terrain. There’s less risk of slipping or falling. If you need even more support, there’s a wide base version with the four legs more spaced out. The cane offers wider height adjustment range than most walking sticks. You can adjust it between 27” and 37”, making it perfect for everyone. The handle is designed with grooves that provide a more secure grip. The only downside with this walking cane is the weight. The shaft is made from chrome-plated steel. Only the neck is made from aluminium. This results in a heavier walking cane than usual. It weighs 1.3kgs. On the upside, it can support more weight. Note that this walking stick is not foldable. If you are planning to do a lot of travelling, consider one of the other folding ones on this list. Quadruped design offers more balance and stability. Adjustable height with a wide range to fit everyone. Extra-strong aluminium + steel design. It can support more weight. It’s a walking cane, it’s a stool and it’s also a torch. 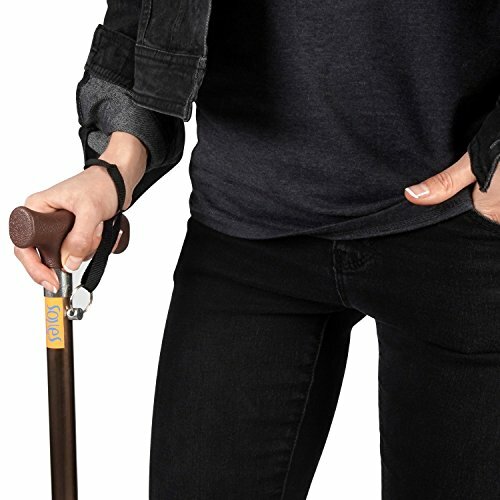 This walking stick comes with a unique versatile design that is perfect for those who love taking long walks. In its normal configuration, it’s a basic tripod walking stick with a comfortable T handle and three wide legs. It’s comfortable to hold and provides excellent stability on all kinds of terrain. If you get tired while walking, you can unfold the integrated stool and take a rest. That’s quite thoughtful and super convenient for long walks and for those who love to go fishing. You don’t have to carry an extra portable chair along. Usually, it’s only rollators that have integrated seats. Seeing one in a walking stick is great. If it gets late before you get home, the integrated LED light in the handle ensures you can find your way. With all these added accessories, the RUIRUI will of course feel a bit heavier. But it’s not that heavy. It weighs just a hair over 1kg. The max weight limit is 113kgs. Good stability on uneven terrain. Perfect for fishing and long walks. Our final pick is a simple affordable walking stick that is great for those who are looking for something cheaper. Despite its basic-looking design, it’s quite strong. It can hold a maximum weight of 135kg, which is higher than some 3-legged walking canes on this list. It’s single-legged so I recommend it mostly for flat surfaces and for those with fairly good mobility. If you need extra support, a 3 or 4-legged cane is better. A non-slip ferrule at the bottom provides traction and grip especially on smooth surfaces like tile. The stick is adjustable with 1” increments from 33” to 37”. It’s also foldable for easy storage. You can store it in the included plastic carrying case. Support more weight than most walking canes.